Dr. Caldicott joined Dr. Arjun Makhijani, President of the Institute for Energy and Environmental Research (IEER), at a public lecture in Washington, D.C. in October 2008. IEER is the sponsor of If You Love This Planet. Dr. Makhijani has completed a decisive study called Carbon-Free and Nuclear-Free: A Roadmap for U.S. Energy Policy, and in this lecture he and Dr. Caldicott address the folly of nuclear power, and discuss the bright future of renewable energy sources. In the first part of the program, Dr. Caldicott details the dangerous misconceptions the nuclear power industry spreads about nuclear energy, and why it can never be a safe and sane solution to global warming. Nuclear reactors, she notes, emit radiation every day into the air and water, and create a major cancer risk for neighboring communities. She mentions a recent report about people living near 16 old reactors in Germany, showing a statistically higher rate of cancer. Two short summaries of the “Epidemiological Study of Childhood Cancer in the Vicinity of Nuclear Power Plants” (the KiKK Study), commissioned by the German Federal Office for Radiation Protection, can be found here and here. Dr. Caldicott talks about how radioactive isotopes released by nuclear power plants are synergistic with toxic chemicals, and become exponentially damaging. In other words, tritium from a nuclear power plant in combination with a substance like carbon tetrachloride, a dry cleaning fluid, will become ten-fold more destructive to humans, animals and plants. Dr. Caldicott notes that the Union of Concerned Scientists has done a study ["Impacts of a Terrorist Attack at Indian Point Nuclear Power Plant"] that finds that 100,000 people would be immediately irradiated by a meltdown in a major metropolitan area. A nuclear accident near New York City, at the Indian Point facility, would mean those in Manhattan and other boroughs would be trapped in gridlock trying to escape, and millions of people would be irradiated. She describes the effects of acute radiation illness, and how the two reactors at Indian Point were actually targeted by the 9/11 terrorists. Dr. Caldicott underlines how important a green-energy transition is now, and how it could help resolve the present economic downturn in the U.S. Solar-powered plug-in hybrid cars are one of many necessary solutions that must be implemented [see illustration above]. 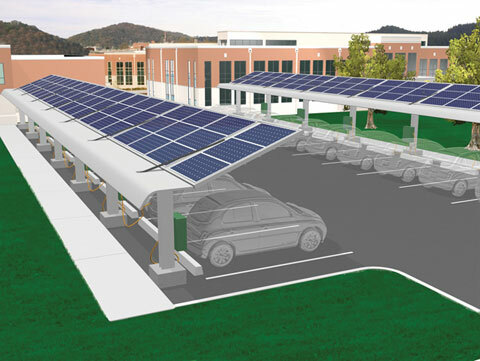 Read Using Solar Roofs To Power Hybrids. Recommended reading: Dr. Caldicott’s books Nuclear Answer Is Not the Answer and Nuclear Madness. The question-and-answer session covers such topics as Chernobyl, weapons in space, the U.S./Indian nuclear arrangement, and depleted uranium (DU). Because of DU weapons the U.S. used in 1991 and 2003, there is a 700% cancer increase in parts of Iraq, and the incidence of severe congenital malformations has also gone up 700%. Dr. Caldicott has stated in many lectures that women in Iraq are now afraid to give birth. To see graphic photos of birth defects induced by the DU the U.S. has now used in several invasions, go to Google Images and search for “depleted uranium” which brings up several pages of pictures. Dr. Caldicott refers the audience to a study on DU from the New York Academy of Medicine. Dr. Makhijani answers a question about electric car batteries, and mentions capacitor technology. Read Cars of the Future, Will Batteries Be Required? This entry was posted on Monday, December 29th, 2008 at 11:46 pm	and is filed under Uncategorized. You can follow any responses to this entry through the RSS 2.0 feed. Both comments and pings are currently closed.